It’s time to get your votes in for the Readers’ Choice Awards for game-year 2016. The only required items are the overall digital / tabletop games, at the end of each of those categories. 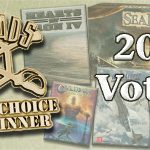 We received no nominations for miniatures rules/expansions, so we’re not doing away with them as a category, but we can’t give you what you don’t nominate! I love CIV VI and HoI IV!